For avid hikers or bicyclers, it may be tough to remember the routes you've conquered, which remain your wish list, and which were your favorites. For those who enjoy spending as much vacation time as possible in the great outdoors, you may be itching for ways to capture those special excursions in order to look back on what made certain trips so worthwhile. If you just so happen to be a smartphone owner, I've got a few apps that can be of assistance. Columbia's GPS Pal: Perhaps the most alluring aspect of this app is its $0.00 price (in addition to being compatible with both iPhone and Android smartphones), but it's no stripped-down program. It allows explorers to fully track their entire trek, add photos along the way, and easily share to various social networks once the journey is complete. Walk Tracker Pro: While it rings up at $2.99, there's something to be said about a single app that'll track runs, walks/hikes, and cycling trips. It also constantly shows how strong (or weak) your GPS signal is, and it has a built-in music player to keep your ears satisfied while your legs work overtime. This app's nifty extra? 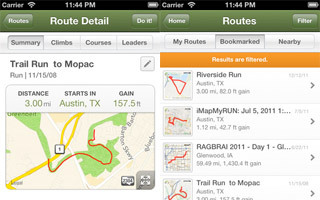 A "ghost runner" feature that can be enabled if you're looking to improve your speed when re-visiting some of your favorite routes. Have any favorite tracking apps that aren't listed here? Be sure to share in the comments section below!